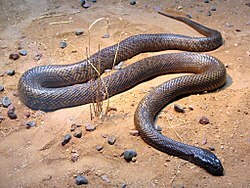 The Inland Taipan (Oxyuranus microlepidotus), also called the fierce snake or western taipan, is a snake in Australia. It is the most venomous snake on Earth. It belongs to the Elapidae family. Although it is venomous, the snake is rather shy, and prefers to escape from trouble. A bite from the inland taipan is fatal to most creatures. One bite from the snake contains enough venom to kill about 100 people at once, and it can kill someone in just 30 to 45 minutes. ↑ "Our Animals - Reptiles - Venomous Snakes - Fierce Snake". Australia Zoo. Retrieved 2009-05-21. This page was last changed on 18 May 2018, at 19:03.